i am stunningly bad at drinking when on the bicycle. it may be a throwback to my misguided days of mountain biking when the thought of stopping, even briefly, for a slurp of something, even water, was deemed less than rock 'n' roll. however, if your bike handling skills are as feeble as my own, reaching down for a bottle while negotiating heaven knows what, was alsways going to end in tears. and often did. though i'm inclined to figure that the statistics oft quoted regarding the huge loss in riding efficiency by electing or forgetting to drink anything while circumnavigating the estates are of a wider range than mentioned, i would concur that regular intake of liquid really is something that ought to accompany each ride. unfortunately, knowing this and acting upon it seem to be clearly two totally disassociated events as far as i'm concerned. despite heading out with the best of intentions - drink within the first ten minutes and continue to do so at regular intervals - i'm lucky if i remember the original supping, never mind the follow ups. therefore, on the majority of occasions, i head out with an almost full 500ml bottle and arrive home with almost exactly the same quantity. as a portion of society, we as cyclists tend to have a more off-centre view of food, nutrition and hydration than the regular civilian. 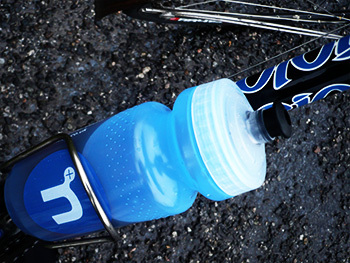 so while water is rarely the most stimulating of liquids to consume on a bike ride, the need to do so is often the over-riding factor. or it would be if i paid closer attention. thus i will often complete a two to three hour ride on a sunday morning with the only liquid passing my lips being a large soya cappuccino at deb's come the end of the ride. the downside, and proof of the fact, if you like, is that i will then return home and consume a bottle and a half of san pellegrino and at least half a litre of orange juice. demonstrating conclusively that my lack of consumption on the bike is not a physiological need my body does not have. water will, of course, slake a needy thirst, but it will not replace the minerals and electrolytes lost during exercise (note my use of the latter as opposed to training). many a carbohydrate solution will satisfy this replacement need, but rather obviously, it comes with a carbohydrate payload which may or may not be required in the first place. as a process of elimination, and always allowing for an improvement in memory and willpower to enforce drinking in the first place, what is needed is something that will do the minerals and electrolyte bit, yet avoid anything of an energy replacement nature. 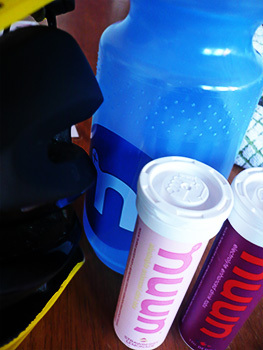 nuun tablets (pronounced 'noon and bearing a rather smart and simple logo) would appear to be among the more efficacious of solutions (if you'll excuse the double entendre). as is often the case, for blokes at least, i ignored any instructions that may have been helpfully printed on the side of the convenient little tube of tablets, and popped a strawberry lemonade flavoured button into my bottle of water. 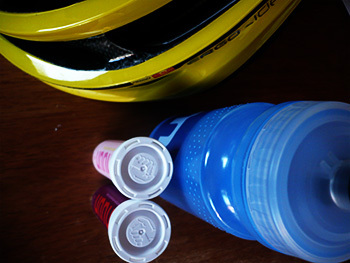 though it certainly flavoured the water, my now improved supping habits detected a surprising lack of depth; in other words, i should have put two tablets in, a mistake remedied on ride number two using two effervescent fruit punch flavoured buttons. so much of a difference did this make, in fact, that during the subsequent ride, i drank the entire contents of a 500ml nuun bottle. and it was lovely. without subjecting myself to all manner of scientific tests, i haven't the faintest idea if all those minerals and electrolytes have been satisfactorily replaced, and to be quite honest, i don't really care. the very fact that they made me drink more when cycling, without my setting a reminder on something electronic (which would rather ruin the moment, don't you think?) is good enough for me. worth the price of admission alone. 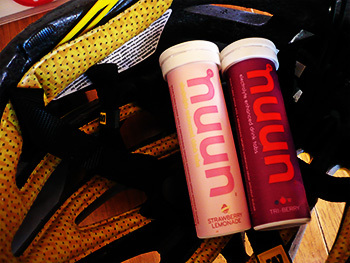 in the unlikely event of strawberry lemonade or fruit punch being not to your taste, nuun also offer flavours such as orange ginger, grape, kona cola and lemon tea. each tube contains a dozen tablets and can be purchased in packs of four for £24. and a fetching blue water bottle is a mere £4.